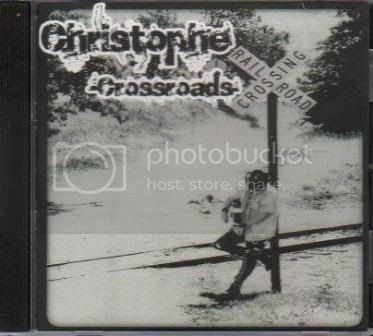 Christophe's 2009 release "Crossroads" is something you should definitely run out and grab if you like Warren Zevon and/or Michael Hurley. Though, I should warn you not to be expecting the more obvious eccentricities of Zevon or Hurley. Also, to be sure you run out and grab the right 4 song ep, this is Christophe, formerly of Mockingbird Lane, not Christophe the French singer song writer born to Italian parents, and certainly not the Christophe who lead the Haitian revolution. 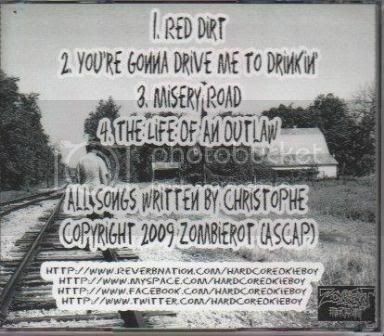 The ep begins w/ "Red Dirt," a confessional sounding ballad w/ a narrator that "walks a fine line between heaven and hell." "You're Gonna Drive Me to Drinkin'" is a folk country song that describes a love affair that has soured and ends w/ the narrator announcing his exit. My personal favorite track, "Misery Road" reminds me of Nick Cave's "Murder Ballads." Yes, it reminds me of the whole album, and no, it is not a murder ballad. It's a mix of vocals and sentiment w/ the narrator lamenting, "take my advice and stay away from misery road." The final track, "The Life of an Outlaw" is the testimony of a road weary traveler who has "been called a bruiser..." How often do you hear anyone use the word "bruiser" in song? Not very, which is another good reason to check this ep out!